The brutal killing of innocent citizens in the name of war on terror, suicide attacks by the so called militants and the country facing political instability, critical law and order situation, judicial crisis or judicial activism, financial crisis, foreign DEBT, inflation & hunger, un-employment and religious intolerance crash the country throughout the year. The present and previous inhuman acts faced by the non-Muslim citizens of the country and the way they are suffering for their survival as non-Muslim citizens are not out of sight. The government totally failed to protect the non-Muslims especially Christians and also not even bothered to highlight the brutal attacks’ findings in public at large. The government also failed to execute their policies to discourage extremists and radical elements and abortive to stop the propaganda against non-Muslim citizens in the country. The hard liner groups and the state spread hatred and religious intolerance among different communities and as a result many innocent people killed and injured. Attacks on churches, Christian colonies, false blasphemy accusations and registration of false blasphemy cases by the religious zealots for the completion of their vested interests, forced marriages after forced conversions (where under age Christian girls were forcedly converted to Islam and later forced them for marriage), inequality (where Christians also suffered at their work places and faced discriminatory behaviors by the co-workers) especially with the bonded laborers at brick kilns’ & social boycott by the fellow residents after false allegations of blasphemy, discriminatory legislation and various other forms biased and unfair attitudes are not new in Pakistan as whenever people provoked and misinterpreted by religious extremists from the Mosque’s loudspeaker usually a mob without inquiring the matter enraged and attacked. There are so many massacres witnessed that how the Christians attacked, maltreated, killed and tortured. Here are few incidents where in Rahim-Yar-Khan Church was attacked in 1986, Shanti Nagar massacres took place in 1997, Terrorist attack on St. Dominic Church Bahawalpur in October 27, 2001, Islamabad Protestant Church attacked in March 17, 2002, the Murree School was attacked in August 05, 2002, Sangla Hill Church & schools attacked in November 2005, a Church attacked in Chianwali-Daska Sialkot on December 25 (day of Christmas) in 2004, Churches attacked in Karachi & Sukkur in 2009, Christians attacked & tortured in Bahminyawala Kasur in June 2009, Christians attacked, their houses were demolished, burnt in Korian village in July 2009, Christians in Gojra city maltreated, burnt alive and their houses attacked and looted in August 2009, Christians also attacked in a village nearby Sambrial Sialkot and St. George Grecian Church attacked in Bannu Cantt in 2009.
lost their eyes. There are no effective bars on extremists from the majority Muslim community waging allegation against religious minorities for desecration of Holy Quran, derogatory remarks in respect of the Holy Prophet, hurt of religious feelings, holy personages or places and forced occupation of churches and associated lands and graveyards. CLAAS along with civil society organizations are forefront to save & protect the injured as well the affected Christians after attacks by extremists and was actively involved for their rehabilitation as well as their legal counseling. The civil society continuously played an important role in ensuring institutional guarantees for the protection and promotion of all civil, political, social and cultural rights for all citizens without case and creed. They urged harmonious co-existence, regard for difference of opinion, respect for basic rights and democratic values and norms. CLAAS remained engaged in extensive advocacy at grass root, national and international level to drawing attention for addressing evils as poverty, ignorance, violence, coercion, injustices and victimizations. 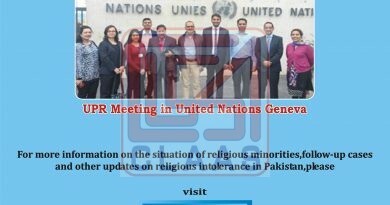 CLAAS tried its level best to raise the core issues faced by the Christians in Pakistan and demonstrated continues struggle to protect religious minorities from hatred, discriminations, violent attacks and maltreatment in the name of religion by the extremists and other religious fundamentalists.